I am back after a wonderful 10 days of rest and relaxation! I wish I could say that was true but I am sure you all understand when I say, vacationing is exhausting! As much as I love going away and doing something other than the usual grind, it is so wonderful to come home and crawl into your own bed. I don’t know about y’all, but even though its great to get a break from the kitchen chores and cooking, I can only eat restaurant food for 3 days max and after that I am wanting to cook and eat home food again. We ate out the entire trip pretty much except for one day when we had a family BBQ. I thought I would share some photos from my trip since I haven’t started back in the kitchen yet and though I have post or two ready to go, maybe you’d like to see a non food post? Here is my Spring Break 2013 trip to a Houston wedding and San Antonio, for two days of actual Spring Break. Despite all the tiredness and fatigue, I had a fabulous time! It was so wonderful to see my dad, siblings, nieces, cousins, aunts, uncles and friends! We were eating a lot, talking and laughing way too much and sleeping in the wee hours of the morning. It was a lovely family reunion after about 4 years. My cousin looked very handsome on both his receptions. The bride was gorgeous. We all got a chance to dust off our party clothes, do ourselves up a bit and party! We had a midnight pie run to the House of Pies where we cousins took up 5 tables on a very busy Saturday night/Sunday morning, much to the annoyance of other patrons who obviously weren’t having as much fun as us! My cousin waiting for the arrival of his bride. My son, Laith with the bridegroom, they are best buds. I also had the chance to meet up with the very lovely Denise from the blog From Brazil to You. If you remember, she did my very first guest post. It was so nice to meet the lady behind the wonderful words and photos. She treated me to a delicious lunch at The Turquoise Grill, a Turkish restaurant serving authentic Turkish fare. We had a lovely lunch and great conversation. She has two beautiful daughters who were such perfect little ladies and became great friends with my daughter.Thank you Denise for lunch and your friendship. 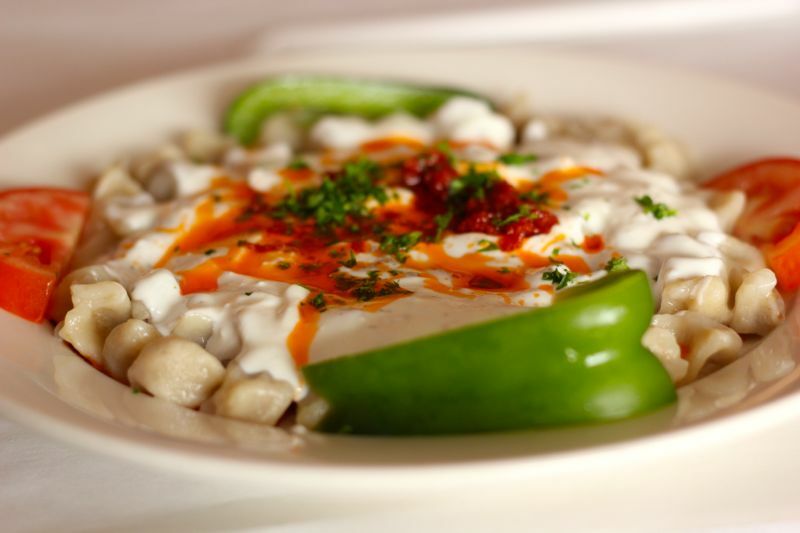 Turkish manti: dumplings filled with ground beef covered in a yoghurt and mint sauce. Thank you for welcoming my guest bloggers and leaving such wonderful comments while I was gone. I apologise for not replying to comments and for not visiting everyone but with the time frame I was working within and shoddy wifi at best, I just couldn’t get to everyone. I really appreciate y’all stopping by! Hope y’all have a great rest of the week. Welcome back! Looks like you had a great trip! I know what you mean about being tired after vacation. Normally I feel the same way but I returned from our recent trip feeling really relaxed. Nice to see some pictures of you. Nazneen, you are beautiful! Thanks Barb! I had a fabulous time even though it was tiring and I am still exhausted. Thank you for your very sweet words! Sugar et al recently posted..Autumn! And a Persimmon Creme Brulee. Thank you so much and welcome! I hope to see you around! It was a really nice trip Minnie. Family and friends everything was perfect. Thank you so much my friend for guest posting for me! Thanks GG and I really have to thank you for that fabulous guest post! Welcome Home Nazneen,I can totally understand how family vacations can be fun and totally exhausting as I myself came from Las Vegas after a short vacation. Weddings can be more tiring as there are so many ceremonies and too many relatives to meet. But its good that you spent two days in San Antonio visiting tea gardens and meeting your fellow blogger friend Denise. Thank you for sharing beautiful pictures of your vacation. Thanks Balvinder!Hope your trip to Las Vegas was somewhat relaxing! I know what you mean about vacations being exhausting! Sounds like you had a terrific time, however. Welcome back! Thanks John! It feels good to be sleeping in my own bed! Sounds like you had a great time, Nazneen. Love that bluebonnet picture and off-course yours. Thanks Lail! The bluebonnets were gorgeous and all over San Antonio. I had to take a photo, they are so beautiful. Thanks John! It was a nice trip and I had tonnes of fun, but I am glad to be back in my own bed. Sorry, what I meant was, I don’t know anyone in San Antonio but a visit to the Tea Garden might be a good reason to go there, anyway! I do have a friend in Dallas whom I have never visited. I will look at Google Maps to see how far they are from each other! That Japanese Tea Garden is fascinating! Maybe worth a trip to San Antonio for that alone? Its definitely worth a trip!San Antonio has many wonderful places. They also have a very nice botanic garden and zoo. Dallas-Fort Worth has wonderful gardens too. There is a Japanese garden at the Fort Worth conservatory. I love these photos. The wedding holiday sounds like so much fun. Aren’t you lucky to meet Denise! I think she’s really special. Thank you Maureen! I agree with you, Denise is wonderful! Nazneen: I am so glad that you had such a great trip!!! Thank you for accepting my invitation for having lunch with me and my girls. It was a real pleasure to meet you and your lovely family. Thanks Bobbi! It was loads of fun! Most definitely Uru!I think I covered all the bases for a great vacay!